This was not so easy for a Monday . I don’t get 20A, soft soap. That’s really out there. Even when I filled it all in up there, I still thought it couldn’t be right. “Soft soap” is not an expression that is used much anymore. It’s comparable to “sweet talk.” I filled it in after getting a few letters without any hesitation. several this time around threw me for a loop, for the beginning of the week. @Cathy – might be old-fashioned; thus, my territory. As for me I had no errors, but nevertheless didn’t really know SKUA, MOMBASA, and RUPERT, the last being young people’s knowledge. 12:33. I found that much more difficult than a typical Monday. Wednesday-like….at least. I’ll just say that is an incredibly kind clue for WELFARE STATE. I did have one error – I had UnTURNED heads and RUnERT. What do I know about “Buffy the Vampire Slayer”? Tax day. Ugh. I hope everyone is better prepared for it than I am. I’ll be dealing with it all day. It’s difficult not to take this personally: The Cathedral of Notre Dame is on fire. Its spire has collapsed and it’s predicted that the entire wooden interior will burn. It’s been there since 1163 and catches fire the day before I leave for Paris? Murphy is working overtime … 😳😳😳😳. Looking at that footage. It looks awful. I guess there was some construction going on inside the cathedral, and that’s the suspected culprit at this point. Maybe South Bend, Indiana doesn’t sound so bad now…..
@Dave – Did you solve the meta on Friday? I knew it had something to do with the “ore” in the long answers but didn’t have a clue what that was. D’oh! Notre Dame was such a wonder to behold. Hopefully, whatever the cost, they will rebuild the structure. The loss of artworks inside is another issue entirely. I had a couple of travel experiences that I’ll always remember. One was arriving in Cairo the day after the assassination of Anwar Sadat and the other was being in Thailand for when an attempted (ultimately unsuccessful) military coup in 1981. I’m sure your Paris trip will be still be wonderful, even though a lot of people there, and around the world for that matter, are going to be grappling with some tough emotions. I did solve Friday’s WSJ meta. I got it a couple of minutes after finishing the puzzle (which kind of made up for my embarrassing failure the week before). Notre Dame de Paris has been on my bucket list for about 65 years, ever since I read the Victor Hugo novel in which it figures so prominently, so I’m not ashamed to say that I shed tears earlier today, and I’m sorry that I passed up a chance to see it in 1969. Of course, my loss is but a tiny fraction of the world’s loss. And, as you say, there will be other things to see and do in Paris … 🙂. It sounds as if you’ve had some interesting trips. I envy you … 😜. 11 minutes even, and no errors. Embarrassingly slow time, exacerbated by my diminishing vision. I misread the clue for 10 A as 14 across’, so I couldn’t see how MING could fit there for several tense minutes. Ugh, it is definitely a Monday. LAT: 6:35, no errors. Felt harder than Monday usual – probably my brain being in a fog though. WSJ: 5:33, no errors. Newsday: 6:15, no errors. Again harder than usual. Don’t think there’s a CHE this week. New Yorker: 40:51, 3 errors. Harder than the last ones have been. Got caught up on a couple of phrases I’ve never heard before in my life (24D, 42A). 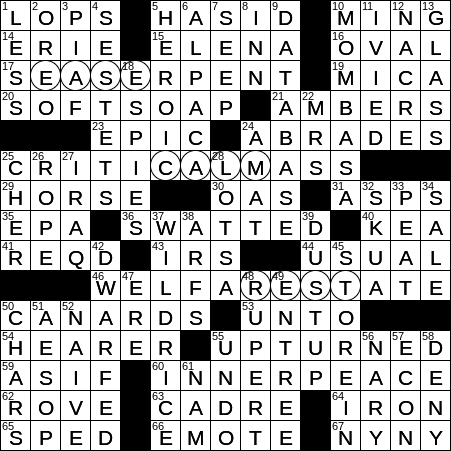 Of course like I say, sure as I see it in one of these crosswords, I’ll never see it again and probably won’t remember it the next time it shows up in a crossword. I don’t see any reason for anyone here to cheat (I know I sure don’t, or I’d be making myself look better for late week stuff than I am). Besides, Bill has competed in a contest called The American Crossword Puzzle Tournament, where he has had to do puzzles in the presence of a roomful of others. If he cheats, others would see it. I will note too, the champions of that contest would do these puzzles in roughly half the time that he does, and would do that New Yorker I mentioned in about 1/4 of the time I took. While this comes up enough with a number of us here (myself included) that it should be a FAQ, all Bill and the rest of us that for our own personal reasons post times are doing is proving that the kind of times for these puzzles is possible. I had a trip to Belgium on a student exchange long ago. The thing that surprised me was how many big old buildings like that are in Europe – one in about every town of any appreciable size. I happened to be fortunate enough to visit several. It shows the presence and force of Catholicism back through the Middle Ages. While that one is a special one, thankfully there will be numerous others that have a certain amount of fame attached to them. Probably of interest to me if I ever got to see France would be the Troyes Cathedral, since it got modeled in a video game I played back in that day called Deus Ex. That said, I didn’t have a library or any resources to consult, so I would have loved to dig into the history of the area to see what kind of notable places I would want to visit. Fortunately, the Internet would be there for me if I ever go the chance again. But, if he posts a time less than an hour and he does not report a “DNF”, then he did the puzzle entirely without outside help of any kind. @Glenn … That New Yorker was a bear. It took me 45:10, with no errors, but I debated for some time over the entry for 44A, which was the one thing I’d never heard of. I also had serious problems filling in the upper middle and upper right, but eventually all those entries made perfect sense. Thanks for the link. The catacombs are also on my bucket list (maybe as a substitute for the sewer system that I read about in “Les Miserables” 😜). YES. The was a hard Monday puzzle. I didn’t make it through it. Felt like a Fri/Sat one to me. And Notre Dame! OMG. How awful. Such a loss, but guess some has been saved. Jeff: What’s your reference to South Bend? I’m originally form S.B., Ind. @kay … A few days ago, Jeff asked me where I was going on my trip and I gave an evasive answer, so he humorously replied that it appeared I was either going to Paris or to South Bend. And that SW corner really threw me! I guess I never understood the word CANARD… I thought it meant a saying, like an adage. Dave, I’m glad you didn’t really fall off a ladder! And, I’m glad the structure of Notre Dame is still standing. As you may know by now, certain wealthy French men have pledged literally hundreds of millions in donations toward restoring the cathedral. I’ve heard that there is already talk of rebuilding the spire.